Heinrich Scheuerman was born in September 1837 in the Volga German colony of Yagodnaya Polyana, Russia, the son of Heinrich Scheuerman (born 1809) and Maria Elisabeth Fuchs (born 1813). Heinrich married Maria Elisabeth Hergert in 1859 in Yagodnaya Polyana. Maria Elisabeth was born on May 9, 1841 in Yagodnaya Polyana, the daughter of Philipp and Margaretha Hergert. Heinrich, Maria Elisabeth and their family immigrated to the United States in 1876 arriving in New York on October 24th aboard the steamship Mosel which sailed from Bremen, Germany. Traveling with them were Maria Elisabeth's parents and her brother Adam Hergert and his family. The Scheuermann's, along with a large group from Yagodnaya Polyana, first settled in Kansas. A son, Heinrich (Henry) was born there on June 6, 1878. A daughter, Cornelia (Nellie), was born on May 19, 1880. 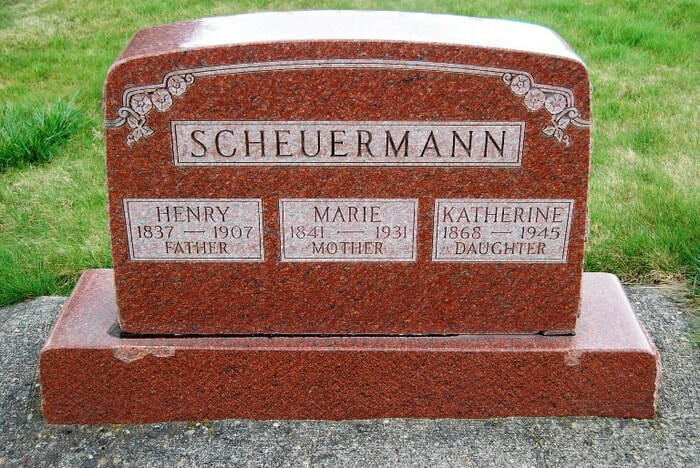 The Scheuermann's were among the first Volga German immigrants in Oregon, traveling from Kansas in 1881. Heinrich (now Henry) is listed in the 1882 Albina City Directory as a laborer residing at the Oriental Hotel. Adam Hergert is also listed as a laborer residing at the Oriental Hotel. Also listed at the same location are Conrad and John Scheuermann (listed as Scheirman), It does not appear that Conrad and John remained in Oregon after 1882. They were likely part of the group that moved on to the Palouse country of Eastern Washington. The 1900 U.S. Census shows two households headed by Conrad Schireman (born Dec. 1854) and John Schireman (born Jan 1836) residing in the Endicott Precinct of Whitman County. Both appear to have been part of the Yagodnaya Polyana group that arrived in the United States in 1876. Finding suitable farmland in the Cornelius area west of Portland, the Scheuermann family moved to rural Washington County by 1883. A daughter, Amalia, was born on August 3, 1883. The Scheuermann's were members of St. Peter's Lutheran Church in Blooming, Oregon which was established in 1889. In 1900, the Scheuerman family is living near Adam and Anna Maria Hergert the Cornelius area of rural Washington County. Heinrich (Henry) died November 13, 1907 and was buried in the Blooming Cemetery. Maria Elisabeth (Marie) died on September 6, 1931 and was buried with Henry and their daughter Katherine.